Thursday, July 26, 2018 by: Isabelle Z. (Natural News) This week, a team of scientists reported discovering a lake beneath the surface of an ice cap on the southern pole of Mars. This lake is not small by any means; it measures 12.5 miles wide and is a very significant finding. The scientists made the discovery using the Mars Advanced Radar for Subsurface and Ionosphere Sounding, or MARSIS, which is a type of radar the penetrates the ground from an orbiting spacecraft. They used the radar to survey the “Planum Australe” region of the red planet over the course of three years and made the groundbreaking announcement in a study published in the journal Science. While past water discoveries on the planet have been attributed to runoff from ice, this is a legitimate body of water, the scientists say. Significantly, it could be the best clue so far to potential life on Mars. The surface of the planet continues to be considered inhospitable to life, but this lake could be home to alien microbial life. Moreover, the scientists point out that there could be even more of these underground lakes elsewhere on the planet that simply haven’t been discovered yet. It is not yet known if this lake is merely a relic of Martian oceans past or part of a larger network of underground lakes. 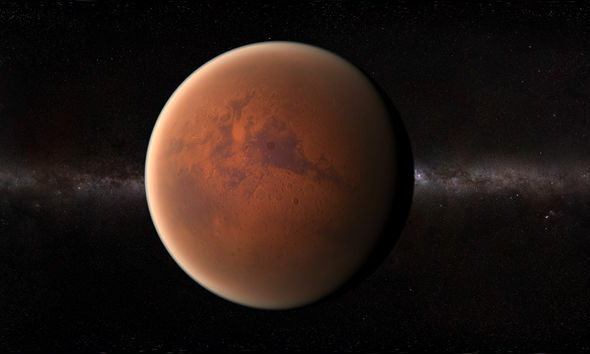 Open University’s Dr. Manish Patel told the BBC that scientists have long been searching for life in the subsurface of Mars, which is protected from harmful radiation and boasts more favorable temperatures and pressure levels. He says the new finding is akin to a treasure map guiding scientists to the best places to look for life on the planet. He added that in order for the water to be a liquid at such cool temperatures, it probably has a lot of salt dissolved in it. Experts say that such briny water could have trouble sustaining life, but it’s certainly possible life exists there. However, flying a robot to Mars that can drill through a mile of ice isn’t technologically feasible right now. It will be interesting to see what remarks they make about the discovery of a persistent body of water on Mars – if they even acknowledge it at all. Experts say the new findings should put the debate over the presence of liquid water on Mars to rest for good. It’s something that Natural News has been talking about for many years, with Mike Adams commenting in articles and interviews about NASA’s politically motivated cover-up of the existence of water and life on Mars. Natural News has written about the discovery of microbial life on the planet in 1976 with the NASA Viking lander, something the agency scrambled to explain away by calling the instrument’s integrity into question. Nevertheless, onboard gas chromatography backed up the findings – although that was covered up, too. Incidentally, our own planet has a lake of liquid water hidden under ice caps. The freshwater Lake Vostok sits 2 miles below ice in East Antarctica and measures 143 miles long, making it one of Earth’s biggest lakes in terms of size as well as volume. Thousands of species of bacteria and fungi live in the lake, so it’s not too much of a stretch to imagine that life could similarly exist in this newly discovered Martian lake. Previous :Why is the CDC spreading false fear about backyard chickens?